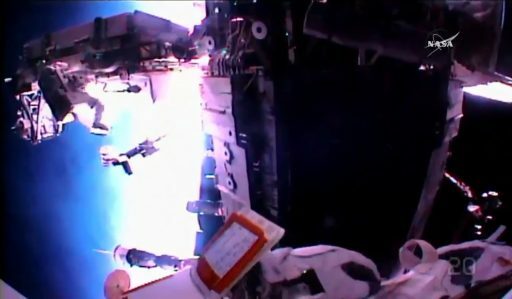 A busy end-of-week spacewalk was performed outside the International Space Station on Friday by NASA Astronauts Peggy Whitson and Jack Fischer to outfit the Station with a new external avionics box, diagnose the Station’s prime astrophysics payload, service the Japanese robotics system and install protective covers – racing through their task list after the EVA was shortened to four hours due to an airlock-related problem that prevented the crew’s space suits from fully charging their batteries. 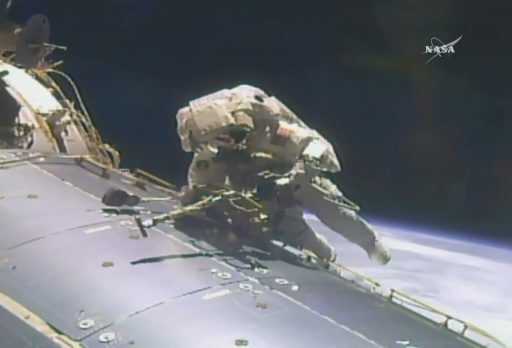 Friday’s EVA – the 200th in support of ISS Assembly and Maintenance – got underway with a rocky start as teams on the ground and in orbit had to overcome the failure of one of two space suit umbilicals that keep the suits supplied on cooling & electricity while still inside ISS. 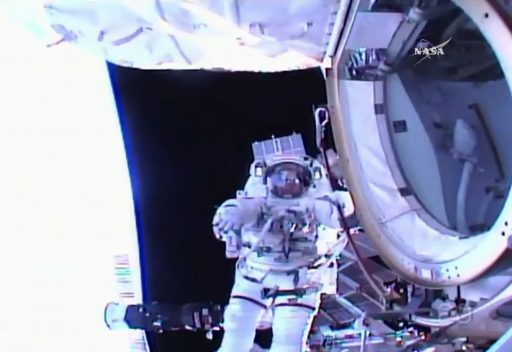 Once out, veteran spacewalker Peggy Whitson, making her ninth excursion, and EVA rookie Jack Fischer were only tasked with the core objective of EVA-42 that was to replace an external avionics controller box out on the Station’s starboard truss segment. U.S. EVA-42 ran four hours and 13 minutes and brought the Station’s total EVA time over 200 spacewalks to 1,248 hours. Showing incredible efficiency, Whitson and Fischer expanded the one-task EVA plan by blazing through their objectives, managing to check off four primary tasks plus one get ahead out of an original six tasks expected when the EVA was still planned for 6.5 hours. International Space Station spacewalk operations started in December 1998 with three EVAs performed by Jeff Ross and Jim Newman on the STS-88 mission of Space Shuttle Endeavour that delivered the first U.S. building block – the Unity Node along with a pair of Pressurized Mating Adapters. 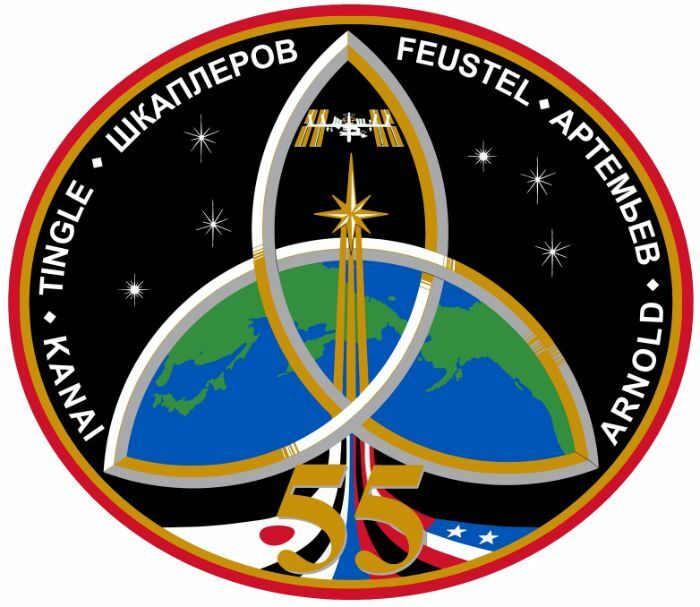 Their task eighteen and a half years ago was forming the electrical/data bridge between the U.S. and Russian Segment of ISS as Unity joined the Zarya module in orbit. Since the early days of ISS, spacewalking astronauts accomplished a number of feats – assisting in the integration of the Station’s 109-meter long truss structure, outfitting the various modules as they arrived in orbit and dealing with equipment failures calling for contingency spacewalks at multiple points over the Station’s life to date. 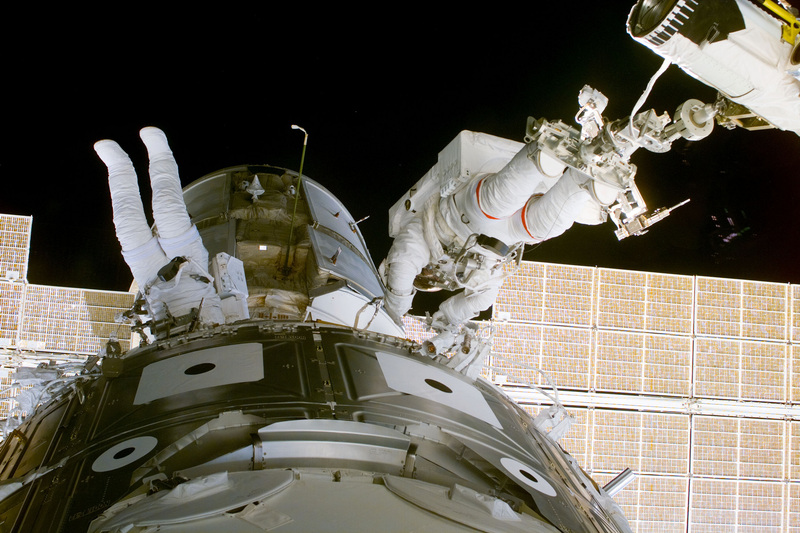 Most of the Station’s 200 EVAs were carried out by visiting Shuttle crews who characterized their missions as a sprint – allowing for multiple EVAs in a period of only a few days to deal with ISS assembly tasks. With the Shuttle’s retirement, all EVAs fall into the hands of resident Station crews whose mission more resembles a marathon – requiring careful management of crew resources over extended flight durations. The shift from Shuttle EVAs to only ISS stage EVAs also brought about a major change in training as crews could no-longer rehearse specific EVA tasks and had to prepare for a range of spacewalk scenarios. With these changes in ground-based training, plus the use of virtual reality onboard ISS, crews have shown that even tasks that were not rehearsed specifically can be carried out efficiently in orbit. 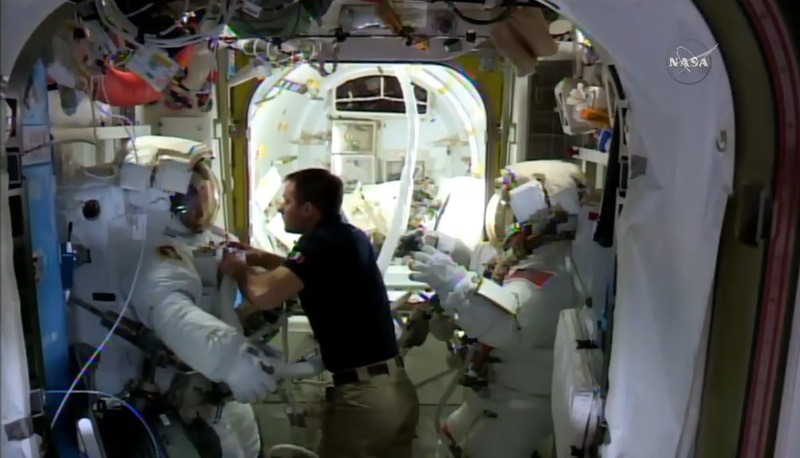 Friday’s EVA was slightly different as both spacewalkers did have a chance to rehearse the core task of removing and replacing the Express Pallet Avionics Controller Assembly (ExPCA) at the Neutral Buoyancy Laboratory prior to departing for space. The need for replacing this particular controller on Express Logistics Carrier 4 arose when it began showing a partial loss of thermal control and teams desired to have a new unit in place as ELC-4 takes up a series of science experiments over the course of 2017. The ExPCA is a rather large piece of equipment – measuring 156 x 39 x 28 centimeters in size and weighing 91 Kilograms, residing on the forward-facing side of the Express Logistics Carrier and acting as a central power distribution and data hub for all Orbital Replacement Units and experiments installed on the ELC. ISS has a total of four 4.9 x 4.3-meter Express Logistics Carriers delivered by three Shuttle missions in 2009 and 2011, loaded with external Orbital Replacement Units that were pre-positioned prior to the Shuttle’s retirement to have plenty of spares available for the second half of the Station’s life. Because of their Earth or space-oriented position, the ELCs also provide suitable locations for various experiment payloads – requiring an architecture to provide power to the payloads and routing science data to the ISS data systems – a task completed by the ExPCAs. ELC-4 recently became the home of the SAGE-III payload that is completing a multi-year mission to monitor ozone and aerosols in Earth’s atmosphere and the next ELC-4 payload – the Multi-User System for Earth Sensing – is already installed on the Dragon SpX-11 spacecraft for an early June launch to ISS. These two payloads deliver a wealth of data and need a robust routing system, requiring the ExPCA replacement to be completed before the next Dragon mission. Friday’s operation began bright and early for the crew – as has been typical they quickly jumped ahead on the timeline and by the time Fischer and Whitson had donned their suits were around one hour ahead of schedule. Just as they were pressing into an hour-long pre-breathe protocol, Fischer noted water emanating on the exterior of his Extravehicular Mobility Unit (EMU). 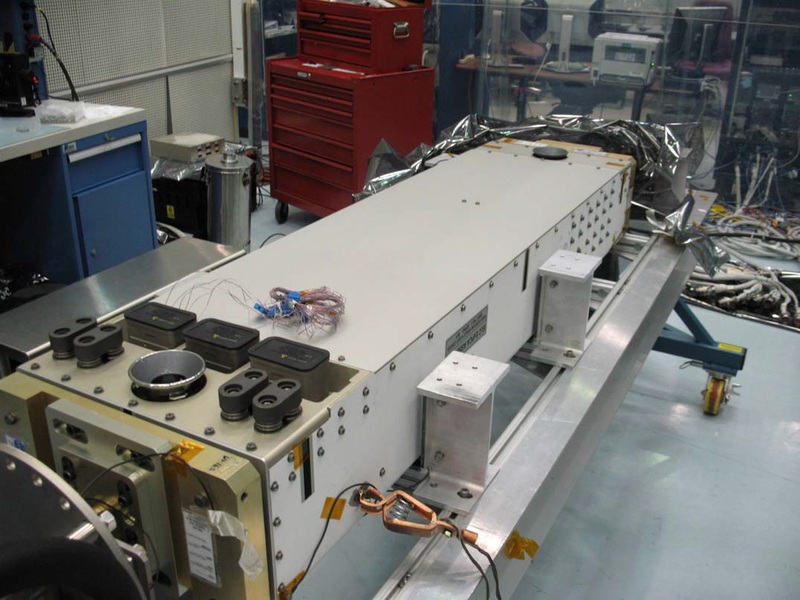 The source of the leak was quickly identified to be the Service and Cooling Umbilical that delivers cooling water, power and data connectivity to the EMU from ISS systems. 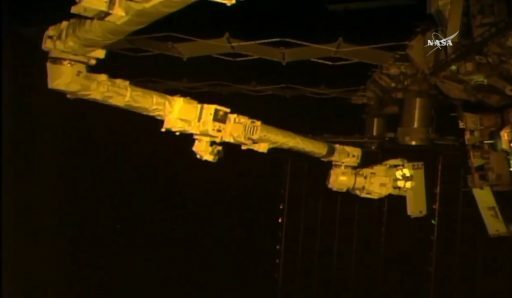 Thomas Pesquet – handling IV duties and robotics on Friday – immediately went into action to turn off the water while Mission Control began evaluating the problem. Through data from Fischer’s EMU, it was clear that the suit itself was in good shape and the problem was isolated to SCU 2. Per flight rules, an EVA can proceed with only one SCU shared between two crew members. Working out procedures, Mission Control instructed Thomas Pesquet to begin a water recharge on Fischer’s suit (EMU #3006) to replenish the EMU’s water tank while switching the remaining SCU back and forth between Fischer & Whitson to keep both suits at the proper temperature & batteries recharged. 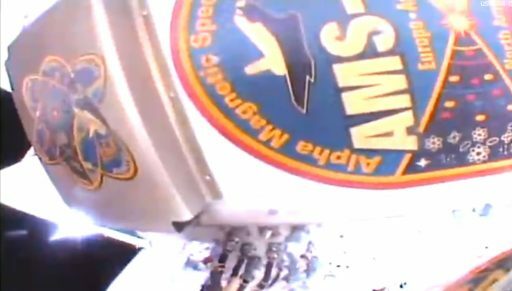 Additionally, Pesquet was tasked with removing the faulty SCU from the Umbilical Interface Assembly inside the crew lock to avoid any hazards from the SCU during the spacewalk. This further pushed the start time of the EVA and the crew re-joined the EVA prep timeline with steps to fit both suits with new CO2 scrubbers before installing the SAFER EVA Rescue devices and moving the crew members into the crew lock portion of Quest for depressurization. Sharing the single SCU available in the airlock caused battery levels on both suits to be partially depleted which led to some concern on the ground and it was decided to go for an abbreviated EVA timeline and complete the spacewalk in four hours – keeping sufficient power margins and completing only the primary task of the EVA. 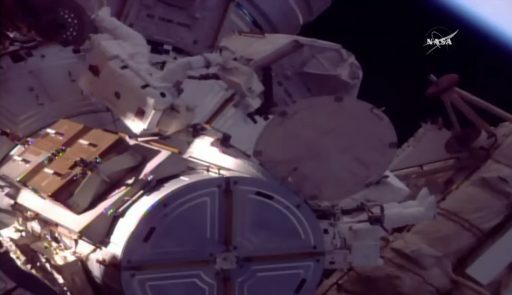 The EVA start time was marked at 13:08 UTC when the airlock had reached vacuum and Jack Fischer – who was connected to the SCU – switched his space suit to battery power. Peggy Whitson, venturing out on her ninth EVA, was first out of the airlock before the ExPCA was moved outside and first-time spacewalker Jack Fischer also climbed out for the usual checks of suits and tethers before getting to work. With no time to waste, Whitson carried the ExPCA over to the S3 truss segment where it was secured to be available for installation. She then moved nadir onto ELC-4 to set up a Multi-User Tether/Ballstack system to hold the old ExPCA once removed. 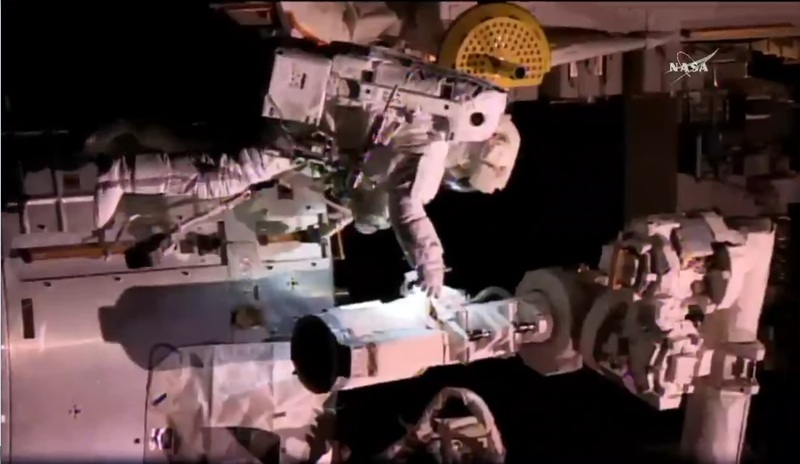 In the meantime, Fischer fitted the robotic arm with a foot restraint and ingressed the arm to be flown over to ELC-4 by Thomas Pesquet to assist in removing the ExPCA with both of his hands. 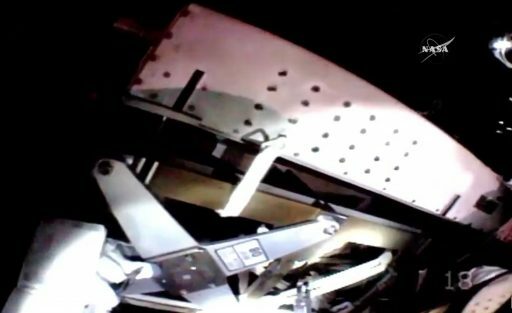 The crew made quick work breaking torque on the three structural bolts with a ratchet wrench before upgrading to the Pistol Grip Tool to fully release the three bolts. ExPCA was then removed from its receptacle and placed on the MUT-Ballstack-MUT as a temporary stowage location. Continuing at full speed, the two crew members met up at the spare ExPCA and retrieved it from its bag before Fischer took control over it and was moved back to ELC-4 by robotics operator Pesquet. 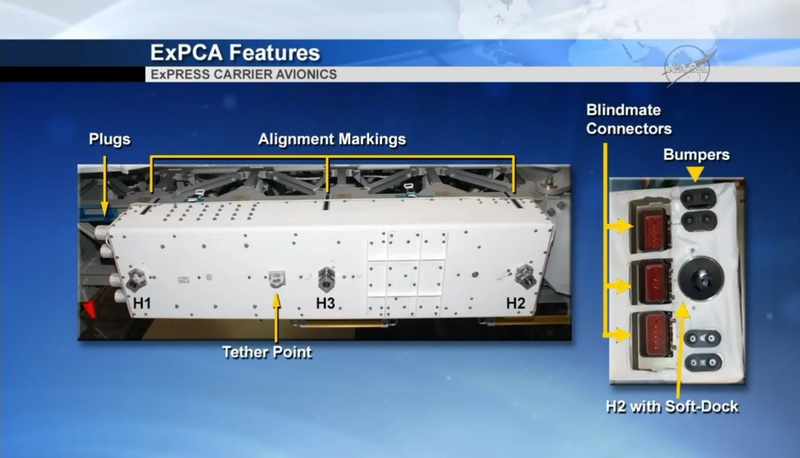 Peggy Whitson provided guidance for soft-docking the ExPCA and after some back and forth, the H2 structural bolt could be driven followed in close succession by the other two bolts to fully install the new unit. Mission Controllers at the Marshall Spaceflight Center applied power to the ExPCA as soon as the crew cleared the worksite, confirming the new unit was in good health and in control of ELC-4 systems. Once the old ExPCA was placed into the bag secured to S3, the crew got the word that they were over one hour ahead on the timeline – allowing two more tasks to be fitted into the shortened EVA. Tasks added from the original EVA-42 plan were the AMS-2 1553 Feedback Terminator Installation – handled by Whitson, and tying down a loose piece of Multilayer Insulation on the Japanese robotic arm – handled by Fischer. 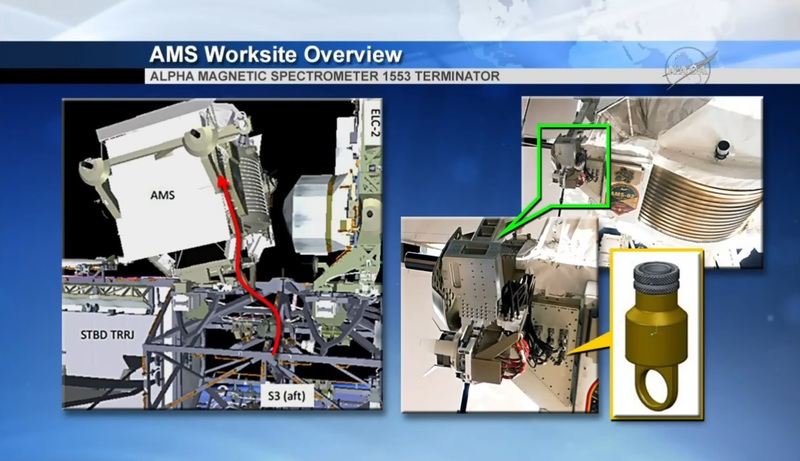 Whitson made her way up the truss and around AMS-2 to reach the IPA connector panel where she was to install the 1553 Feedback Terminator – essentially acting as a line tester to verify this particular command/data path is still functional after sitting unused for over six years since the Alpha Magnetic Spectrometer was installed on the STS-134 mission. As the Station’s flagship astrophysics payload, having recently detected its 100 billionth cosmic particle, there is great interest in keeping AMS-2 alive as long as possible which may require the addition of passive and active thermal control systems as the detector’s own systems have shown some degradation over the last year or so. For planning future outfitting work, engineers need to know whether the 1553 line can still be used for commanding of thermal control systems which will be accomplished through the feedback terminator. At AMS-2, Whitson was in for quite a struggle as the terminator cap needed to be installed in a tight space between structure and other connectors followed by turning it 120 degrees to click into position. After some trial and error, she managed to fully seat the cap followed by the collection of engineering views to help engineers plan modifications to the AMS thermal control system. After finishing his ride on the robotic arm, Jack Fischer removed the foot restraint and headed back to the airlock to fetch a tool bag. He was then headed forward to the Japanese Kibo module’s Exposed Facility where the JRMS robotic arm was parked and waiting for some servicing. Working with wire ties, Fischer had to tie down a piece of Multilayer Insulation on the arm’s boom-to-end-effector interface that had come loose – another trial of patience given the dexterity required when working with the wire ties and MLI fabric. Still well under the PET+4-hour threshold set for the EVA, Mission Control was able to add another task for Fischer – retrieving and installing a shield on the forward base of Pressurized Mating Adapter 3. PMA-3 moved to a new location on Node 2 Zenith in late March and a spacewalk by Shane Kimbrough and Peggy Whitson completed the installation of electrical and data interfaces on the PMA as well as the placement of shields on the aft and around the sides of PMA-3. To fully protect the module’s base from debris impacts, Fischer put down the forward cover and secured it with straps to fully outfit PMA-3 in its new location. 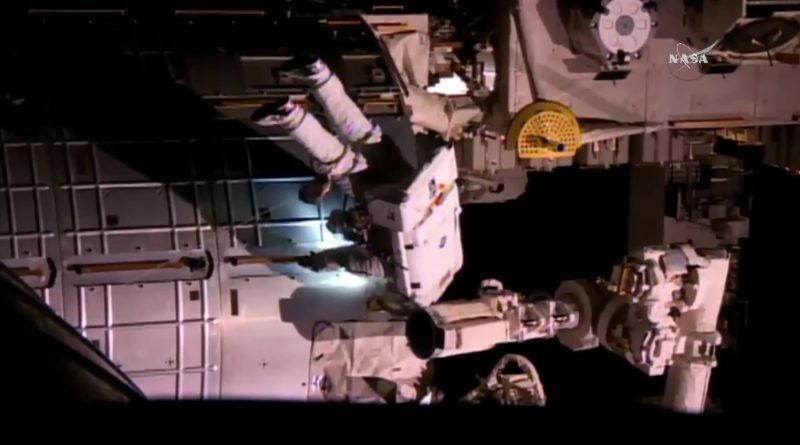 Making use of every available minute, Fischer checked off a quick get-ahead task by relocating a foot restraint from the Columbus module to PMA-3 in preparation for the spacewalk that will see the installation of the International Docking Adapter to the PMA. Closing out the EVA in orderly fashion, Whitson picked up the old ExPCA and transported it back to the airlock. For the return inside, Jack Fischer first topped up his oxygen with the SCU before Peggy Whitson got to use the single Service & Cooling Umbilical as her suit was lower on battery power than Fischer’s since he had spent more time on the SCU prior to the EVA. U.S. EVA-42 had a duration of four hours and 13 minutes, bringing the Station’s cumulative EVA time to 1,247 hours and 55 minutes. For Peggy Whitson, it was the ninth career spacewalk, now with a new total of 57 hours and 35 minutes, still ranking fifth on the all-time list, just under one hour short of reaching the Top 3 for career spacewalking time. After his first excursion, Jack Fischer stands at a total of 4 hours and 13 minutes. 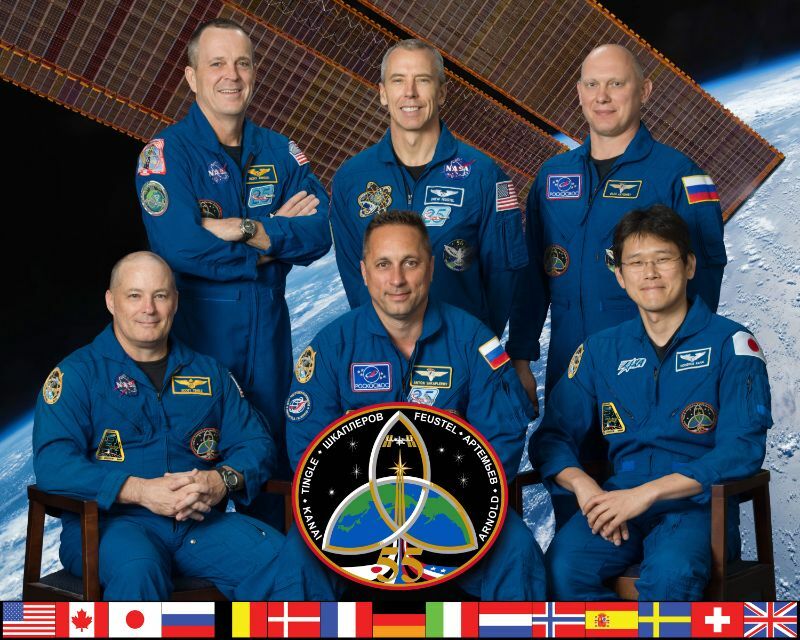 Through heroic efforts in racing through their task list, the crew was able to complete four out of six original objectives of EVA-42 plus a get-ahead task. 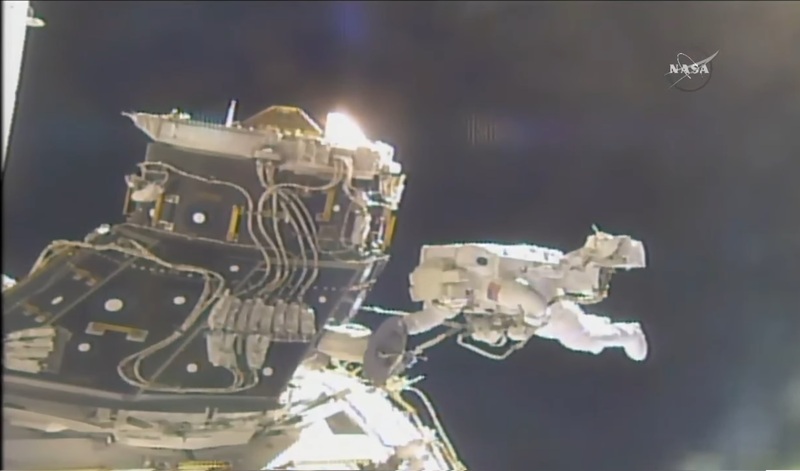 Left open after EVA-42 are the installation of an HD Camera on Camera Port 3 out at S3 as well as the installation of a pair of External Wireless Communications Antennas on the U.S. Lab. Both are non-priority tasks and will be scheduled for a later EVA.